News & Events at Dakota Timber Company — Dakota Timber Co. Check out the Dakota Timber Co. happenings for lists of events and stories featuring current reclaimed wood projects, construction, installation and design. Although ICSS has been involved in the salvaged wood industry since 2008, we are coming up on our second year of business here in Fargo, ND and have decided to begin stocking large reclaimed wood timbers in addition to providing millwork services. Never would we have expected the amazing outreach of support and enthusiasm this community has shown toward this industry in that time. Each day we are growing and helping bring sustainable building products into people's homes and businesses. Our goal isto offer as diverse of an array of reclaimed wood products as is possible. To date, we offer paneling, flooring, mantels, raw board stock, and now a large inventory of beams. We custom machine and mill our wood right here in Fargo. We are the supplier, millwork, and retailer. No middle-men here. With our move to stock large beams, we hope to bring more structural components to people's homes that are 100% reclaimed and sustainable. The idea is that we can reduce the impact of modern-day logging by counteracting the demand with salvaged wood that was already logged over 100 years ago. Since the beginning, ICSS and its founder, Seth Carlson, have always embraced sustainability and reuse over profits. To this day, our overarching goal is to provide affordable access to sustainable products for anyone who demands it. You want to co-exist with the planet? Great. We'd love to help you make that happen. It was an honor to work hand in hand with Napoleon Public Schools this week. I had the privilege of salvaging the bleacher boards that had been in use in their main gymnasium since the 1950s. For those who don't know, Napoleon, ND is a small town in south central North Dakota. 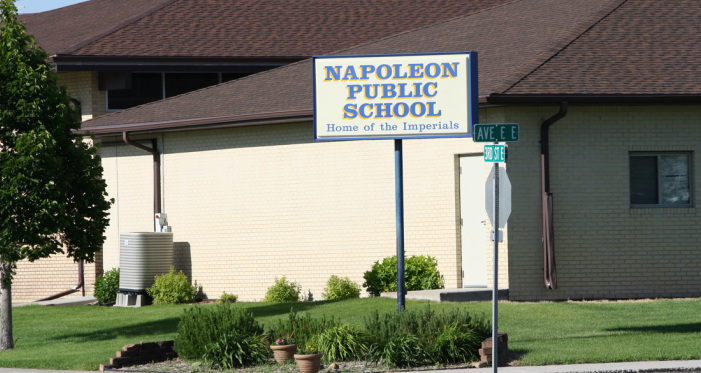 Napoleon is famous for their successful wrestling program which has dominated North Dakota high school wrestling for decades. With over a dozen state team championships on their belt and a multitude of individual wrestling championships, Napoleon is truly a dynasty. As a former North Dakota high school wrestler who spent countless hours watching [and competing against] the Napoleon team, I truly gained respect for these athletes and the community that backed them. A successful program like the Napoleon Wrestling team is only possible with the full support of their community. I felt that support coming from their fans back when I was in high school, and I still felt that pride and support the day I pulled these old bleachers out of their school. It's kind of crazy to think how some things come back around in your life like this. Never did I think thatI would have a chance to own a piece of Napoleon High School history. I can say that it is an honor to hold onto a piece of this history that not only represents the many decades of amazing athletes from this small town, but more importantly--the fans and the community. Without this community, none of this success could have been possible. An immense amount of pride, respect, and love came from fans seated on these bleachers over the years. My crew and I are exceedingly honored that we are able to spread that pride, respect, and love onto new generations. Let's stop just building new houses and instead start building history into our homes... one old board at a time.